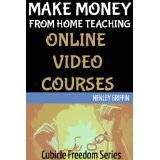 A part of the Cubicle Freedom Series, the Make Money From Home Teaching Online Video Courses book shows you exactly how you can start earning a full-time passive income just by creating and uploading video courses to sell online. While this book is short, it gives you all the information that you need to get started as an online video course instructor. There are no images in the book to inflate the page count – just facts. Please note that this guide is geared more towards people who are new to creating online video courses, or who only have a little experience as opposed to seasoned professionals.